This is a recipe from Fergus Henderson’s book ‘Nose To Tail Eating’, and is something I have wanted to try for quite some time, but I’ve had a lot of trouble getting hold of pig’s spleens. Finally, after waiting about 2 months, a butcher managed to get me some. I have never seen a spleen before, so I was a bit surprised at how long they are, the biggest one was over 45cm. They had a layer of fat on one side which I cut off, you can see in the photo above where the fat was attached down the middle of the spleen. 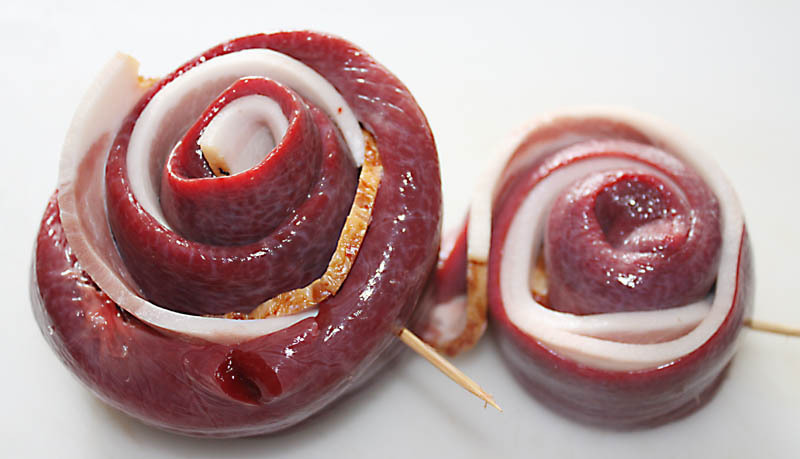 With the spleen laid flat, it was easy to place several sage leaves along it, then a couple of slices of smokey bacon with the rind removed were laid lengthwise on top. It was then easy to roll it all up and push through a skewer to hold it in the roll. The spleens were then placed in a casserole dish, covered with chicken stock and into a medium oven for 90 minutes. They were then left to cool in the stock before slicing and serving cold. 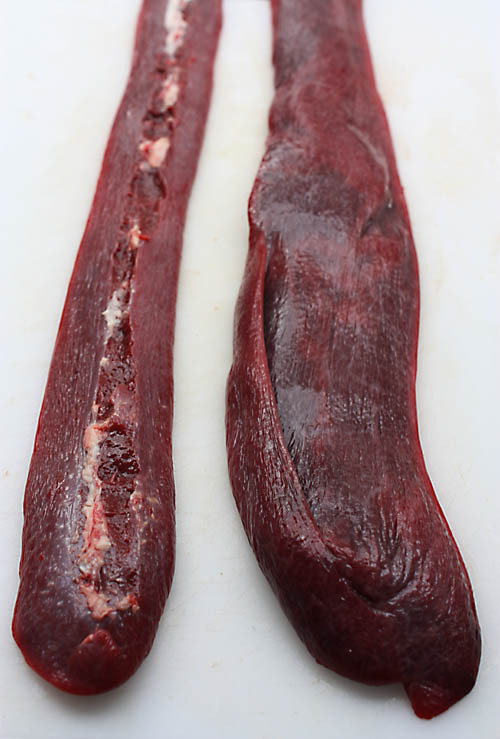 Anyone who likes liver will enjoy these as the taste is similar but not as strong. They are probably more like chicken than lamb liver, with maybe just a hint of pork flavour. I would have expected the bacon to overpower the spleens, but it didn’t. I think that is the genius of Fergus, he gets a fantastic balance of flavours. The amazing thing about the spleens is their texture, so soft and creamy, just like a really good pate. I’m not sure I have eaten Sydney rock oysters, certainly not in the last 10 years or so anyway. 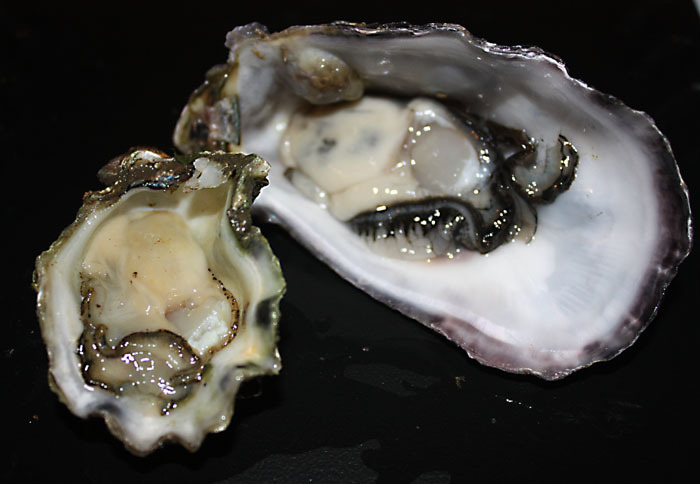 Here in Queensland, Pacific oysters are the commonly available variety. These are not a native oyster, but are extensively farmed, and are large and delicious. I have always eaten oysters ‘au naturel’ and have very pleasant memories of gathering them off rocks as a child and eating them fresh. I don’t know what variety they were, in New Zealand in the 60’s, possibly not Pacific oysters. But I digress…. Last week I had the opportunity to buy and try Pacific and Sydney Rock side by side and compare. I know a lot of New South Wales people claim that Sydney Rock Oysters are the best oysters in the world. Prices were similar per oyster, but the Pacific oysters (shown on the right) were almost twice the size. The Pacific oyster was from Coffin Bay in South Australia, and as I bought them already opened, may have dehydratred and shrunk a little. Certainly for the size of the shell I expected a little more meat, but this is about quality, not quantity, right? I have to say, I wouldn’t mind at all being an oyster taste tester, I rarely buy them, and when I eat them I wonder why I don’t do it more often. I love oysters!!! 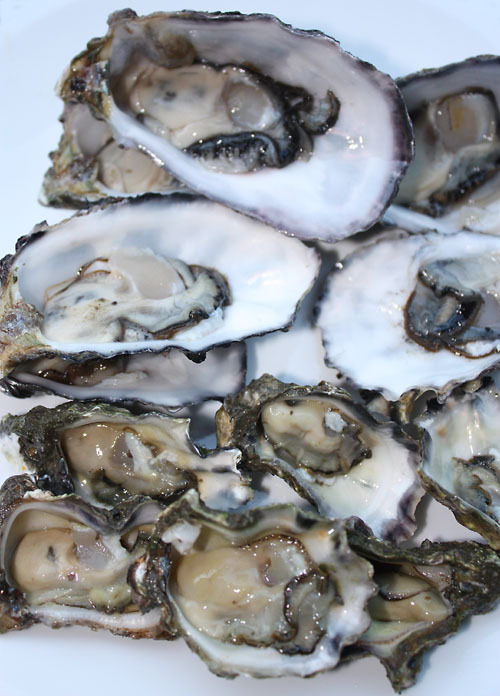 So, to the taste comparison, Pacific oysters are beautiful, there is no argument from me on that, but I think the Sydney Rock oysters are a little sweeter. Not much in it, but I guess Sydney Rocks get my vote. So in the end it does get to quality vs quantity, and Pacific oysters are better value. And as for those people who say Sydney rock oysters are the worlds best? Go try a fresh Bluff oyster from NZ!!! These don’t sound very appealing to most people, particularly dog owners who buy dried pigs ears for their dogs to chew on. But two of my favourite cook books, ‘The Entire Beast’ and ‘Nose to Tail Eating’ have recipes for them, so that’s good enough for me. 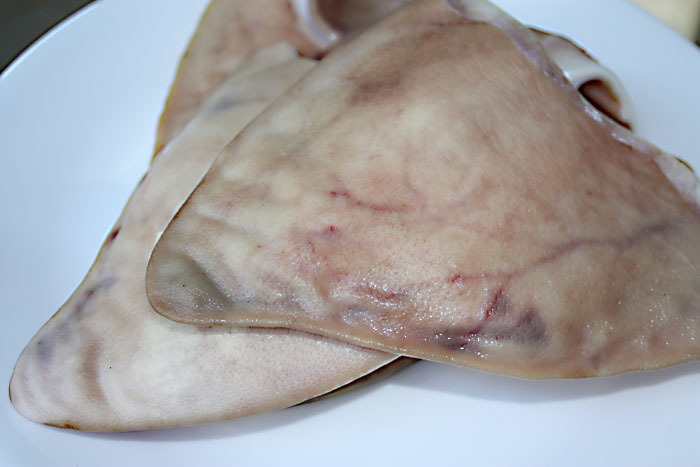 The pigs ears I bought were clean and hairless. I put them into the slow cooker with onions, garlic, fennel seeds, thyme and a bay leaf. The plan was to cook them until soft, but I had to go out before they were done, and by the time I got home they were very soft, possibly overcooked. I removed the ears from the liquid, at which stage the skin came away from the cartilage very easily if not carefully handled. After drying the ears with a paper towel and cooling (between 2 plates to stop them curling), I sliced them into strips. I then spread them with Dijon mustard and rolled them in breadcrumbs. I don’t have a deep frier so I pan fried them. They ended up a little oily, but I think that’s a technique thing (or in my case, a lack of technique thing). The bread crumbs were crispy and the ears were soft inside , with the cartilage being a little harder, but not at all chewy. An interesting combination of textures. I thought they might have a stronger flavour, but there was just a slight hint of pork taste to them. Interesting, but not something I’ll cook again in a hurry. Here’s something I hadn’t heard of last week. Then I watched an episode of Anthony Bourdains TV show ‘No Reservations’. He was in Uruguay, and judging by the amount of meat they eat there, it is where I should live, or at least visit. 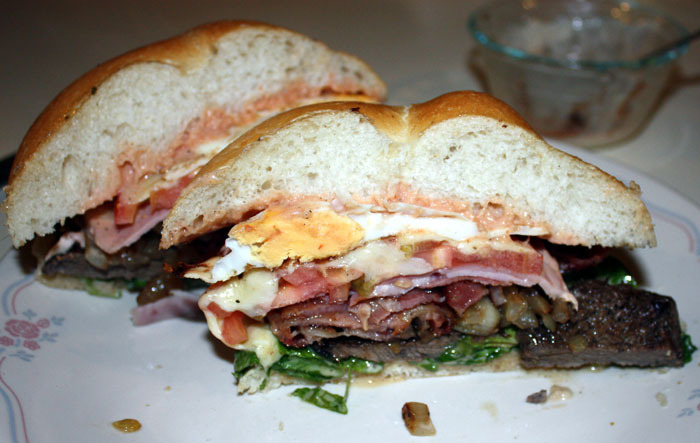 Anyway, the chivito sandwiches looked pretty good, so I googled a recipe and got into it. A trip to my new favourite butcher, Master Meats at Mooloolaba, and I had bacon and ham, both smoked on site and delicious, and grass fed eye fillet steaks from King Island. A couple of large white bread buns from the bakery next door and I was ready. 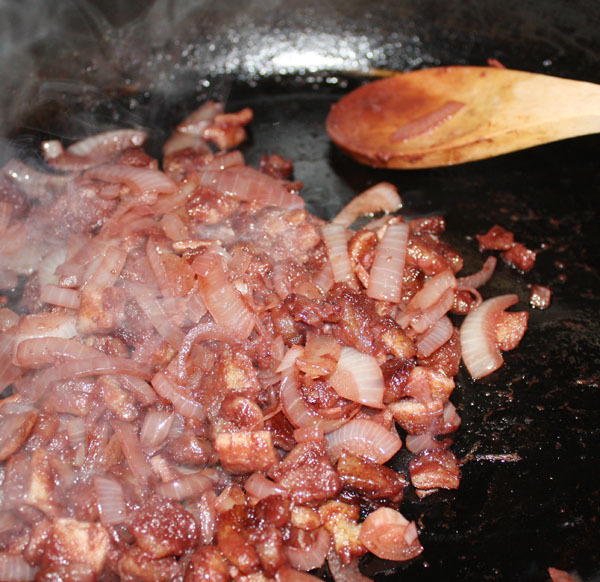 Bacon was cooked until crisp and then set aside. Steaks were about 2 cm thick, so I butterflied them and pounded them to under 1 cm thick before cooking for a couple of minutes on each side in the pan the bacon came out of. I also cooked onion, and fried eggs until the yokes just turned hard. 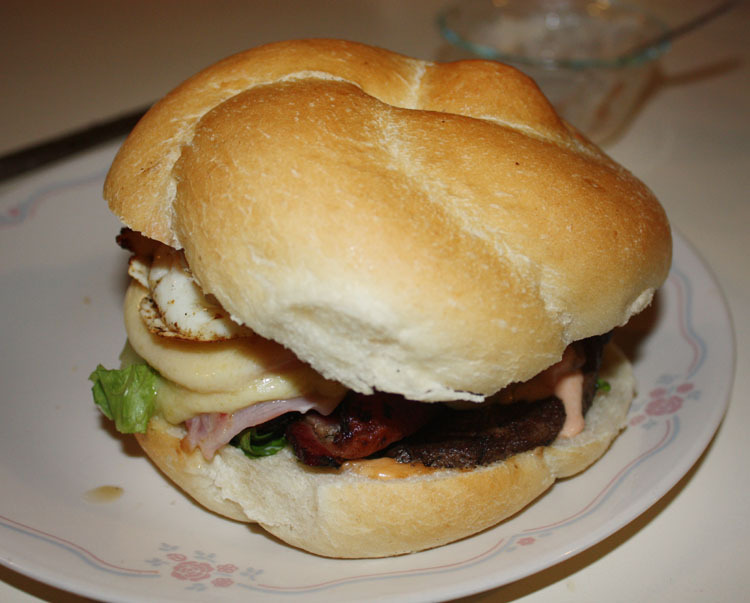 Tomato sauce and mayonaise were mixed together and spread onto the bottom half of the bun, then lettuce was added. Next was the steak followed by 3 slices of bacon and a couple of slices of ham. Then the onion and sliced tomato were added and the lot was topped with sliced mozzarella and placed under a grill to melt the cheese. Then the egg was put on top, with more sauce and mayo, and the top of the bun put on. As you can see, this was a big, full sandwich (really more what we would call a burger) and it was necessary to cut it in half to have any hope of eating it. The combination of tastes were amazing, with the steak and ham complemented by the bacon (and what doesn’t taste nicer with bacon in it?) The sandwich was big, juicy, messy and extremely filling. An awesome meal, I can only imagine how nice real Uruguayan chivitos must be. This is a dish I remember from my childhood. I think we had it fairly often and I always loved it. Tripe seems to be out of fashion nowadays, and when I cooked some a year or so ago I didn’t much like it, it was rubbery and not a particularly nice taste. But I just had to try it again. The tripe I bought was the honeycomb tripe, apparently from the second stomach. I googled a recipe and pretty much stuck to it, first placing it in cold water, bringing to the boil, then draining and rinsing before cutting into 2.5cm pieces. I then put tripe, onions, milk, a bay leaf, salt and pepper into a pot and simmered for almost 3 hours. I then melted butter in a pan, added flour and cooked for a minute or two, then stirred in the cooking liquid, and cooked until it thickened. The onions and tripe were then added and reheated. The verdict? Maybe slightly more palatable than last time, but still rubbery and not a really nice flavour (and it really doesn’t smell nice while cooking). I can’t imagine that I would have liked this all those years ago if it was like this. Makes me wonder if tripe has changed a bit, now that it is probably from feedlot cattle, fed grain and very little if any grass. I’d be interested to hear opinions on that. Here’s a recipe from Fergus Henderson’s fantastic book ‘NoseTo Tail Eating’. 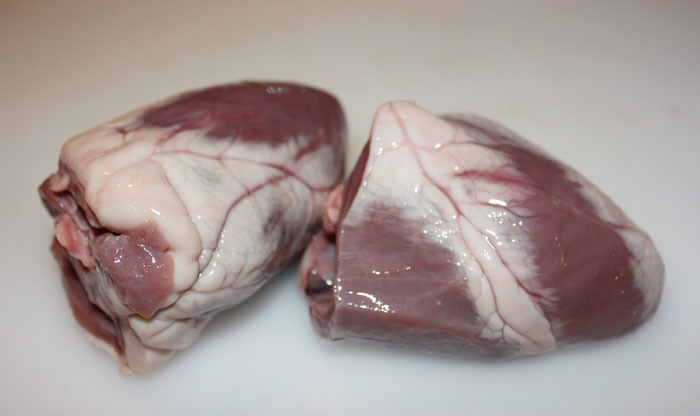 I think I have only eaten heart once before and I wasn’t overly impressed, it was tough and not particularly tasty. But I trusted Fergus not to write about it unless it was good, so I gave it another shot. The hearts as I bought them had been trimmed of veins and sinews at the top, but I trimmed off some of the fat you can see in the photo. The stuffing consisted of 2 onions and 2 cloves of garlic sliced and cooked gently in butter until soft, but not browned. Then I added a large glass of red wine and let this reduce by half. White bread (I used 3 slices) cut into cubes was then added along with salt and pepper. This was cooked gently for 15 minutes, and then left to cool before several sage leaves were chopped and added. 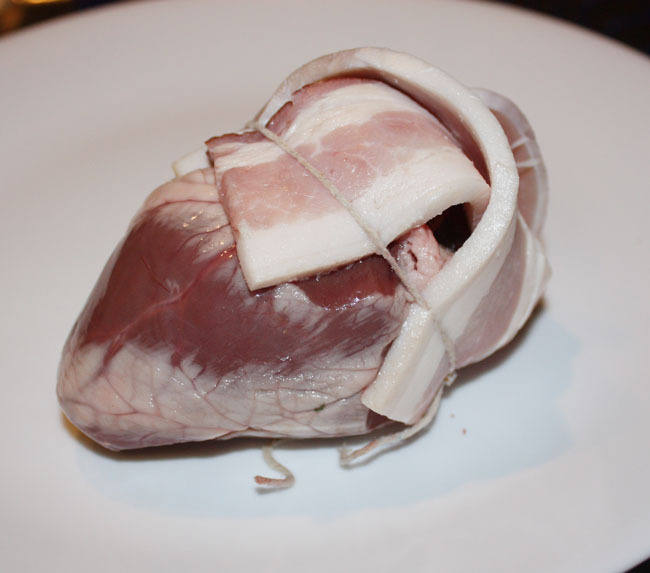 The hearts were then stuffed to the top and a couple of slices of bacon were tied in place to act as a lid. My 3 hearts were placed in a casserole dish (with a large potato to keep the hearts upright), and chicken stock was added, not quite covering the hearts. They were cooked in a medium oven for almost 3 hours, then the hearts were removed and kept warm while I reduced the juice from the casserole dish to make a sauce. The recipe called for this to be served with mashed swede but I forgot and bought parsnip, so I used that instead. 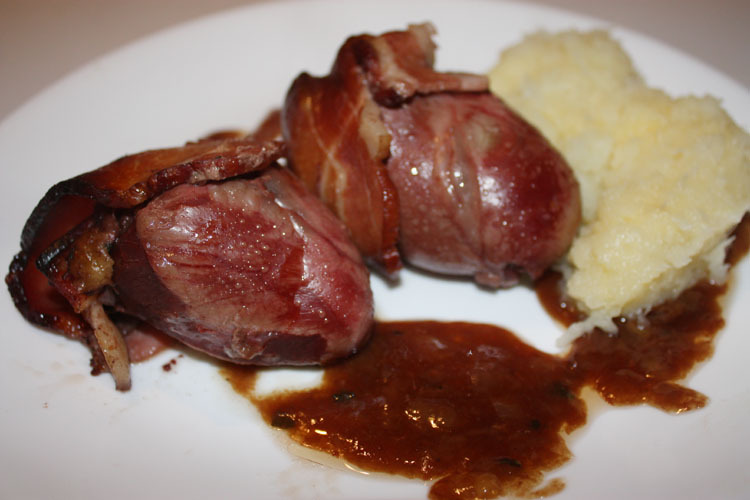 The flavour in this dish is great, the heart was tender, with a very fine texture and I thought a slight taste of liver. The stuffing had a fairly strong flavour, but each heart only held a small amount, so it didn’t overpower the other flavours. The taste of bacon complemented everything nicely. And the sauce was strong and delicious, it looks oily on the plate, but didn’t taste it, the only complaint about the sauce was there wasn’t enough of it. Even the potato I used as packing was delicious, picking up the bacon flavour. This was an awesome dish, thanks Fergus. For anyone who may not know, black pudding is made from pigs blood. 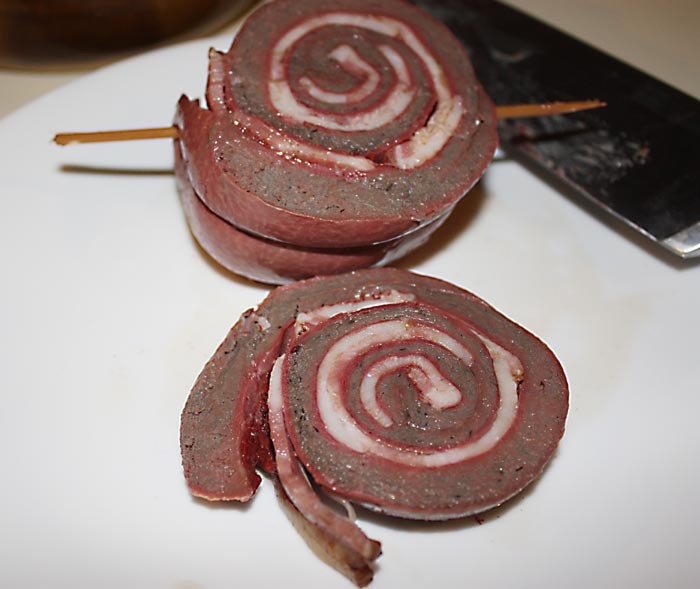 I have only eaten black pudding once since I was a child, and I liked it very much (see ‘Haggis, mutton bird and black pudding’ post). I was recently given a copy of Chris Badenoch from Masterchef’s book The Entire Beast, and it has inspired me in many ways. 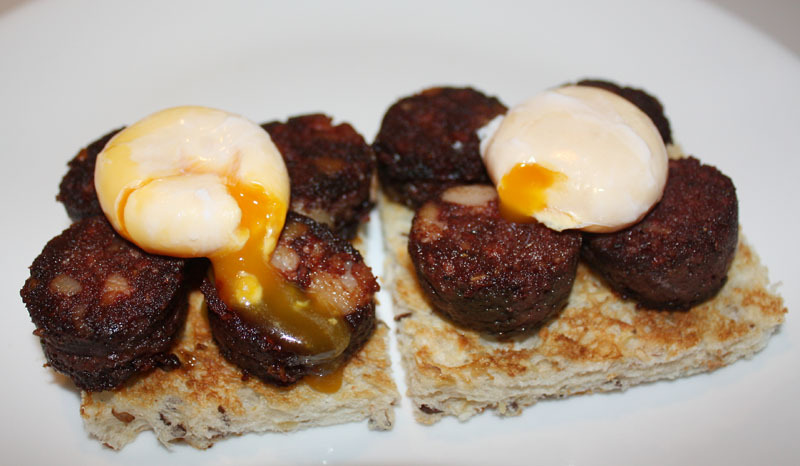 His recipe for blood sausage with poached egg yolk looked amazing, so I had to try it. I don’t for one minute pretend to be able to cook anywhere near as well as Chris, so I have really just taken the basic idea and simplified it to match my skills and the ingredients I had to hand. 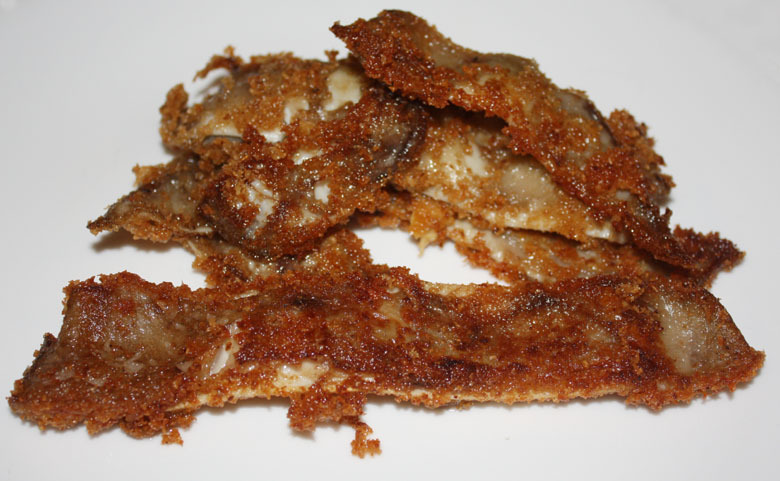 I cut the black pudding into thick slices and fried them in oil until crunchy. The eggs yolks were separated from the whites and were poached for about a minute, then the sausage and eggs were placed on a slice of toast and seasoned. In his book Chris says ‘if you use cage eggs and supermarket black pudding – it will be crap’. Well, that’s pretty much what I used, and it was really delicious. So I would love to try this breakfast prepared by Chris. I really recommend both this meal and ‘The Entire Beast’. Chicken and pork, a chiporken? Mixed Roast. Pork, lamb and beef. Haggis, mutton bird and black pudding.